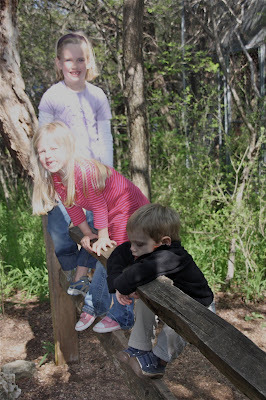 Thursday we went to the Austin Nature Center. It is perfect for kids our age, a little water, a little sand, rocks for Preston to throw, trails, and pathetic animals. Austin has such a guilt complex about caging animals. The zoo is filled with sad, neurotic furry creatures, pacing back and forth, or hobbling around on 3 legs, missing a wing, blind, albino... The nature center doesn't disappoint. Every little animal has a page of it's sob story, usually involving a man with a gun or car, or someone trying to raise the cute fox in the back yard. It's not exactly the tribute to the beauty of God's creation I loved to show the girls at the Houston Zoo, but whatever. We did this for a LONG time. Back and forth, back and forth. Watching the one-winged, one eyed owl. We got a trampoline Thursday after the Nature Center. Andy drove the girls to San Antonio to pick it up and then assembled it that evening. It is my dream to own a trampoline, I personally LOVE to jump, flip and fall. Pretty tuckered out, wearing the "thank you" t-shirt from the girls at Shady Grove. I've decided to call it "The Nanny"
Saturday, the girls and Andy went to Dallas for the day for cousin Austin's 1 year birthday! found your blog and thought i would say hi! we are also adopting independently from rwanda (DTR 01/02/10) and live just up the road in temple. we are also starting a classical university model school here! 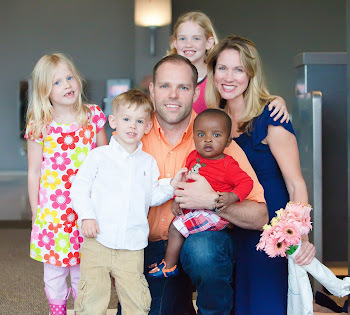 god bless and we'd love to include y'all the next time we get together with other austin area rwanda families! You crack me up Emily!